This is Gloria, a retired Marathon Dancer. She once was the record-holding queen of so-called ‘dance marathons’. Gloria quit these endurance movement contests after her partner, Homer, danced himself to death after ‘dancing’ for 98 hours non-stop. In her heyday Gloria always repaired her own, danced-down shoes: that’s how she learned the basics of shoecrafting. The dayjob of this retired, prizewinning dancer is shoe designer. At night she still dances for money (faking the endurance part of the marathons) and at the same time she promotes her designs. Most of her clients are sadistic men and women with a fetish for shoes. Dancing Queen, 2017, Mixed media (acrylic cube, plastic, glass, paper, 1960s brass enameled powderbox “mascot cream powder“) 9 x 9 cm. All items have been left untouched, no glue or any other permanent adhesives have been used. If you open the gold filled seal this sculpturette will fall apart. 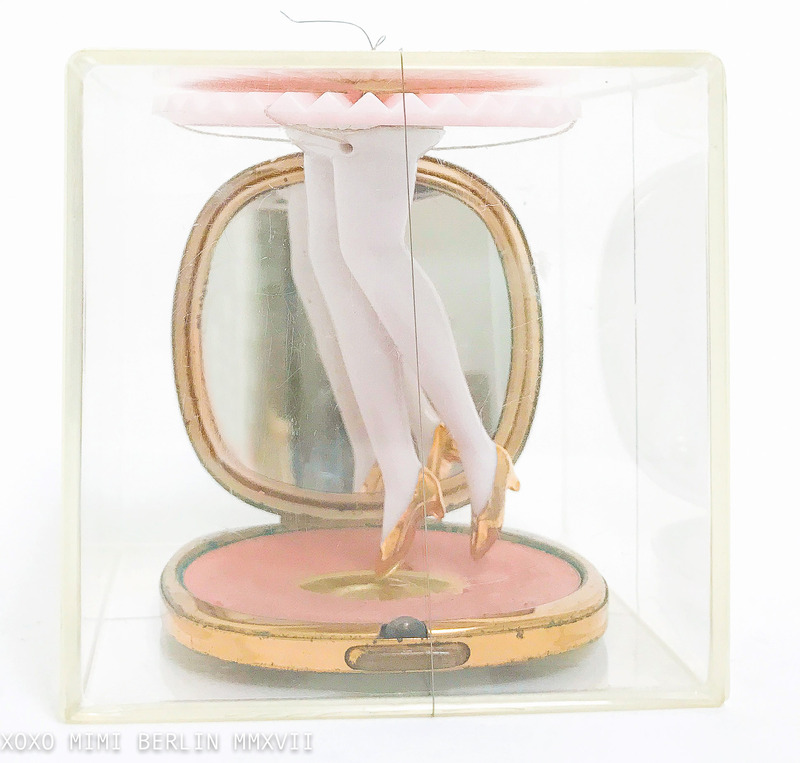 Dancing Queen is part of the Powder Box Girls; a series of statuettes accompanied by their own short story created by Mimi Berlin. The Powder Box Girls are girls of pleasure with double jobs. Working during the day is very important to them, oddly enough without these jobs they couldn’t work the night.